I have witnessed recently the on-the-spot cooking contest sponsored by the Bureau of Plant Industry (BPI) recently as a part of its field day, showcasing organic agriculture and other projects of National Crop Research and Development Center here in La Carlota City. I observed that this contest could be a good avenue and development for prospective professional cook. 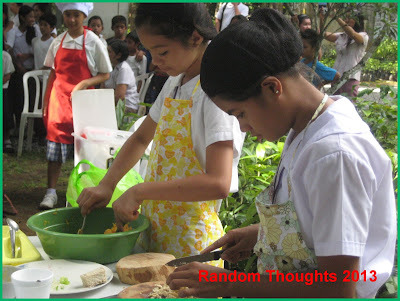 School pupils from Grades V and VI participated in this half-day cooking contest. Actually, BPI Agricultureal Center Chief IV, Milagros B. Abaquita sent a communication inviting those Grade V and VI pupils of five selected elementary schools within the vicinity of the center and our school, Cubay Elem. School was one of the participating schools. The other schools were Nagasi ES, Ferlou ES, Haguimit ES, and La Granja. Each school is required to have one team, compose of two pupils coming from Grades V and VI. BPI La Granja has provided all kitchen tools and ingredients, while the participating schools will bring with them the serving plates or bowls needed for their final menu presentation as well as the apron and head cover. Each team has been given 30 minutes to choose their ingredients, and to write their menu including the procedure. Another 45 minutes for the ingredient preparation and cooking time are required and 5 minutes for table setting. Menu serving size will be good for 2 to 4 persons. The contestants will be judged according to the following criteria: 20% for nutritious, 20% economical, 20% palatability, 20% originality, 10% hygiene and neatness, and 10% presentation. I went ahead of our pupil-constestant. I never waited for the results of the winners. Past 5 in the afternoon, out contestants got back to the school and directly went inside my office and informed that they got the third place. 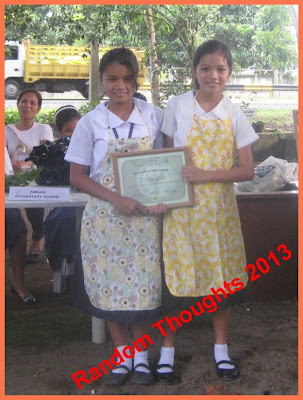 I was all smile that Mia Fe R. Cahilig and Merisa P. Sualog, all grade VI pupils represented our school and they received a cash prize of Php1,000 and certificate. Their class adviser, Ms. Gemma D. Salazar acted as their coach and chaperon. She represented our HE teacher, Ms. Ofelia N. Ayungon who is unable to accompany her pupils. The other winners were Haguimit ES, first place and Nagasi ES, second place. The winning food entries were Kiddie Rice Munchkin for Haguimit ES, Pakbet ala Nagasi for Nagasi ES, and Kalabasa Okoy na Tokwa for Cubay ES. Prices at stake: Php 2,000 for the first prize with certificate, Php 1,5000 for the second prize with certificate, and Php 1,000 for the third prize. The school represented by the contestants also received prizes. First prize, seeds and planting materials worth Ph 1,000; second prize, seeds and planting mmaterials worth Php 700; and thrid prize, seeds and plantng materials worth Php 500. 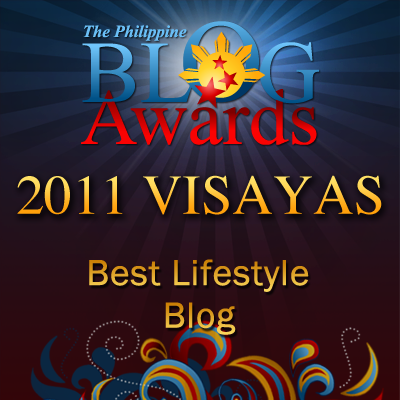 A consolation prizes of Php 500 with certificate to non-winning school participants. 2. Wash the squash, spring onion and cooking utensils. 4. Fine slice of onion spring. 5. Slice the tokwa in cubes. 6. Beat the egg with flour. 7. Put the squash in a big bowl, add the tokwa, onion spring, with egg flour, salt, soy sauce. 10. Prepare the frying pan and if its already hot, put the 1/2 cup of oil and be heated. 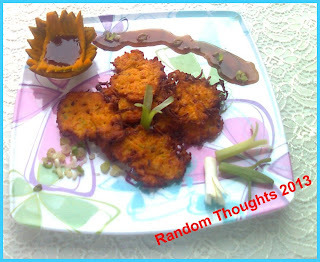 11. fry the squash okoy in one (1) tablespoon until it becomes golden brown. 12. Serve in 4 persons. a slice of pepper (depending on how spicy you want). 1. Mix the flour, vinegar, soy sauce, sugar, water, and pepper. 2. put in a pan with a hot oil and pour the mixed ingredients. 3. Stir it until it becomes sticker. 4. put in a cup. Now ready for serving. Eat and enjoy the spicy Kalabasa Okoy na Tokwa from Cubay Elementary School good cooks, Mia Fe Cahilig and Merisa Saulog.